The hot new restaurant on James Island is Sermet’s Southernterranean Cuisine-Bar, or what people are calling Sermet’s James Island. 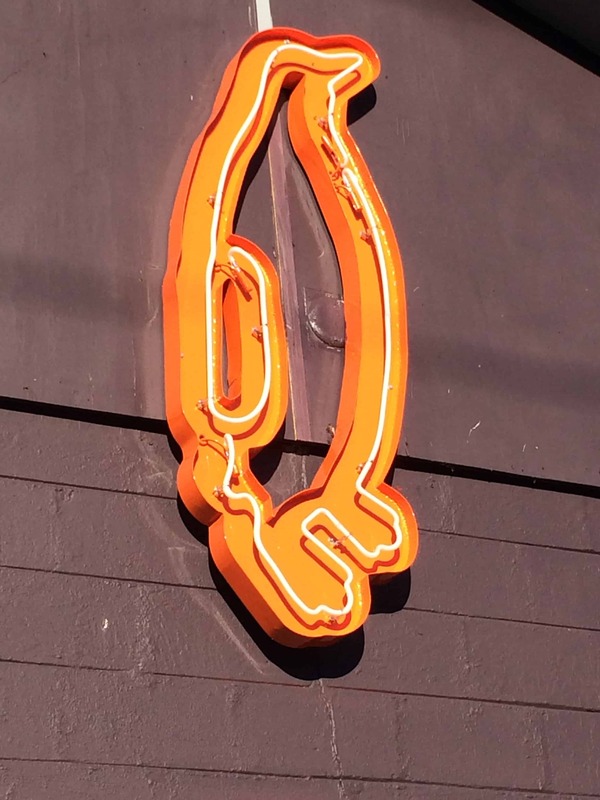 It’s the second offspring of Sermet’s Downtown, which we loved when we went a couple of Restaurant Week’s ago. 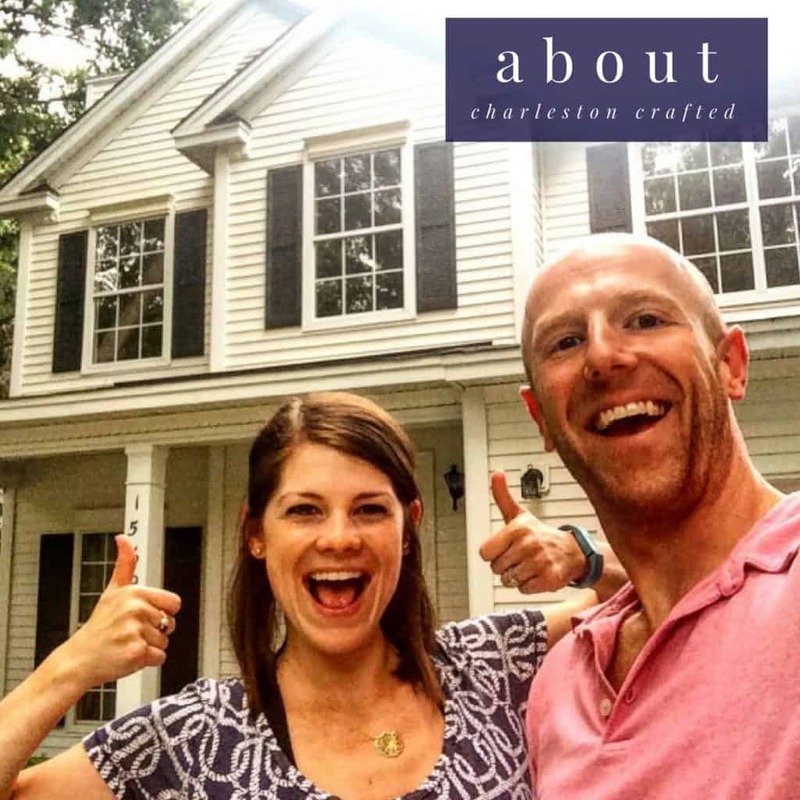 When we saw one was opening on James Island, we had to check it out! The restaurant isn’t huge, but you walk in straight at the bar. Good thing, because we had a 45 minute wait for four people because they don’t take reservations. Outside is a nice patio, so we grabbed drinks and hung out there until our table was ready. The looks of the menu were fantastic as well. 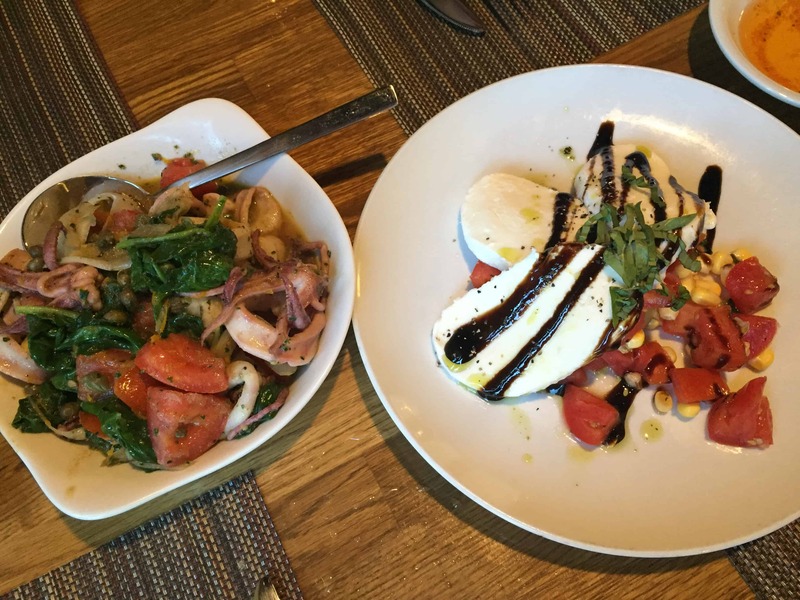 We started off with the calamari and the hand-pulled mozzarella appetizers. The calamari was very interesting, because it was the first time we’d had warm calamari that wasn’t deep fried. It was mixed with spinach, capers and oil and was quite delicious. The hand-pulled mozz was good too, with three slices and a bunch of cut tomatoes, served with a basil oil drizzle. I won dinner. I had the shrimp polenta, which is shrimp and grits but with a seared polenta cake instead of a typical bowl of grits. 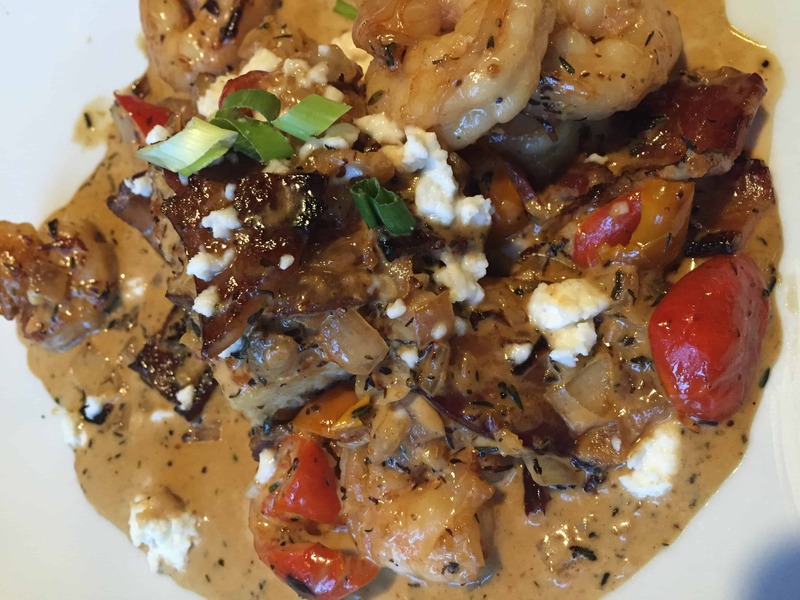 There were tons of shrimp and it was served with an herb marsala sauce, thick chunks of bacon and queso fresco. It was divine. The perfect amount of spice and flavor blend, with a well served cake and slightly cooked shrimp. Morgan ordered the seared scallops (shocker). These two buttery, mouth-melting scallops were served over a crab risotto, which was amazing. 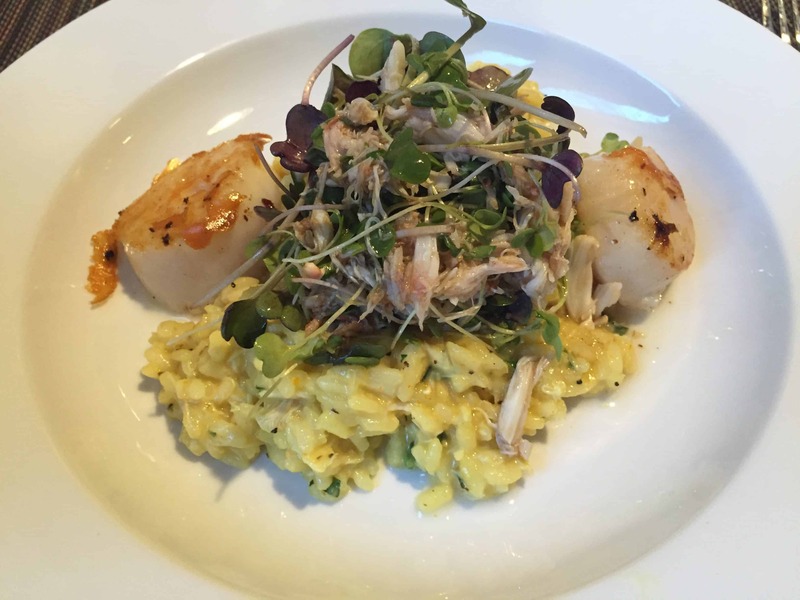 It only had two scallops, so a little light, but the risotto was awesome with the crab mixed in. I also got to try the braised short rib off my buddy’s plate and it was worth it. I barely had to touch my fork to the meat and it fell right off. 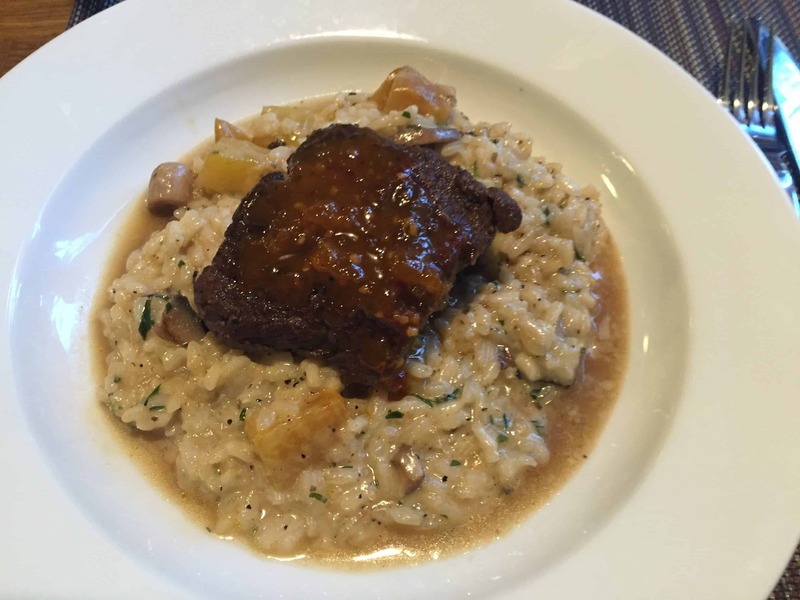 The mushroom risotto that it was served on was even more delicious than the crab risotto Morgan had. We’re curious to see how Sermet’s James Island goes in the end. It is definitely downtown quality with downtown prices, but on James Island. It was a really good restaurant, but kind of pricey and more upscale than the vast majority of establishments on James Island. We’re excited that several nicer places have opened on the island recently. With all the new construction and increased interest in moving to James Island, we assumed retail and restaurants would follow, so hopefully it sticks and does well!